We have just introduced False Eyebrows for Men to our already existing range of Women’s eyebrows. Chemotherapy can cause hair loss to the head and all over including Eyebrows. Alopecia – A hair loss where your immune system mistakenly attacks the hair follicles. For tips on how to apply the eyebrows see our recent Blog on False Eyebrows. We are finding hair loss to the eyebrows are becoming more common and false eyebrows are very popular. They are 100% Human Hair and look very realistic. They are very easy to apply and are reusable up to 3 months. They will need to be reapplied every 7 days. False Eyebrows are ideal for those suffering with hair loss. Hair loss can happen for many reasons. It could be Alopecia, Cancer, stress, Autoimmune Disease, Pregnancy, Vitamin Deficiencies, Hormones, Anemia, Hypothyroidism, Lupus, Dramatic Weight loss, the list goes on forever. When we lose hair it may not be just from our scalp , it can happen where are eyebrows are meant to be. For those who have lost most of their eyebrows, False Eyebrows are ideal as they need to sit flush to your skin in order to give you the seamless look. There are 5 different colours to choose from. False Eyebrows are adhered to the skin with a specially formulated adhesive that is safe for all skin types. There is a special remover that you need in order to remove the brows safely. Once the eyebrow wigs are adhered properly they can last up to 7 days and with reapplying you can use the false eyebrows for 2 – 3 months with proper care. There is also Brow powder that you can use do help define the eyebrow which will give it a more realistic appearance. You can use it as a dry product for a soft natural look or wet for a more dramatic look. Decide where you want the eyebrows to begin. Hold the brows with a pair of tweezers from the tail end. Its always a good idea to mark the area where you think your eyebrow should be with an eye pencil lightly. Simply place the netting side down with your fingers. To remove use the Specially formulated Remover and be gentle removing the eyebrow. Note: False Eyebrows are designed for those who have very little hair left on the eyebrow and not for those who have a lot of natural eyebrow hair. At Wigs Online, we have just started stocking a range of The Final Touch Eyebrows. 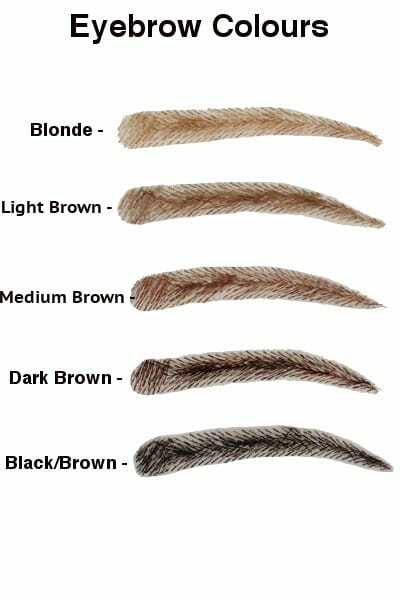 They are 100% Human hair that come in a range of colours to suit everyone. We are very excited to have the new range from Final Touch Brows. The results are just amazing. This is a great Youtube video from Galaxy Dreaming that shows someone actually applying the wigs which you may find helpful.